"I was born in Brittany, France, and I traveled quite a lot before settling down in Bali where I created the festival TrashStock Musik Artistik Plastik to provide local youth a fun, yet educative event through informal education. It’s my hobby project, but I am helping a foundation that aims to solve Bali’s freshwater crisis. Not many people know it, but the tourism is draining the groundwater and plastic pollution. Part of this project involves a comic book educating school-kids about the impact of littering in the rivers. I started my career in logistics in the oil and gas industry. But while the work was great, I could feel it wasn’t my purpose. An amazing experience living in a caravan in the Australian bush allowed me to think of how I could use my skills for the greater good. That’s how I founded PREthical, an online agency matching NGO’s and businesses and sharing their stories. The TrashStock festival is a combination of a sad experience and the wish to combine my personal passions. Every day when I was walking to the office I could see garbage pilling up on the side of the rice field and in the stream. Being graduated in logistics and having a passion for photography and a past as a musician, I mixed everything into TrashStock since 2015 with the help of a Balinese friend I met in Australia. 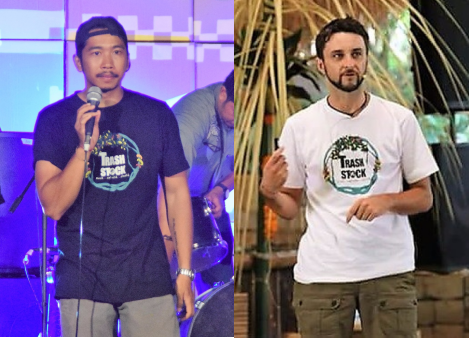 Hendra Arimbawa is the soul of TrashStock and is passionate about making Bali clean from plastic pollution. His positive spirit is rarely impacted by the effort needed to educate his fellows about how bad plastic is for the environment. While we fundraise to make the festival a reality, we are also doing our best to help others. Every year we donate part of our benefits to an artist recycling plastic to create artwork and a NGO promoting creativity for their education about plastic pollution. We follow their work and genuine passion. Of course, we can only make our social program happen if our own fundraising was successful. The 2017 edition is very special because of the International year of Sustainable Tourism for Development. Indeed, so many Balinese work in tourism and many more are studying with the goal to find a job in the industry. However, tourists are increasingly complaining about the plastic pollution and choose cleaner destinations."